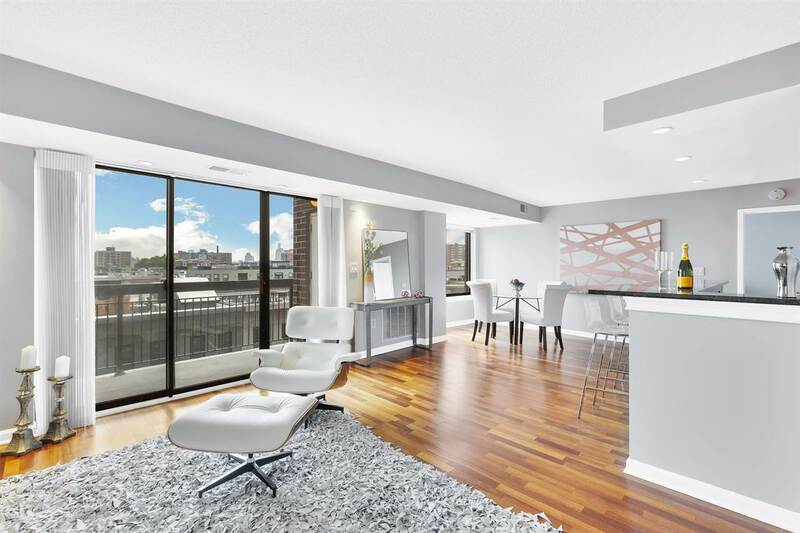 Yes, you can indeed &apos;have it all&apos;... A full service 24 hour doorman building, views of New York City&apos;s most iconic buildings, and private outdoor space to revel in the magnificence of it all. Residence 7E at The Sky Club is a 1265 sq ft 2 bedroom, 2 bathroom corner unit that is enriched by an an impressive array of storage throughout, central air, an in-unit washer/dryer, and a 15 foot wide private terrace with panoramic views of New York City that perfectly frame the Empire State Building and the Freedom Tower. Centered around an open living and dining area with oversized windows and an open kitchen with granite counters, Whirlpool appliances and a breakfast bar, this is a home that allows for uncompromised, easy living day-to-day and effortless indoor/outdoor entertaining of family and friends. For both privacy and functionality, bedrooms in Residence 7E are located on opposite ends. The master suite features panoramic views of New York City, two closets, and a well-appointed private bathroom with a tub. The guest bedroom has French doors and en-suite access to an oversized bathroom with a glass enclosed walk-in shower. The Sky Club is a well-regarded full service elevator building in downtown Hoboken completed in 2004 that offers incredible access to all forms of transportation and everything that makes Hoboken and New York City so special. In addition to a 24 hour doorman and a caring, skilled service staff, The Sky Club offers residents a free shuttle to and from Hoboken Terminal (PATH, Ferry, NJ Transit), an on-site organic market, an on-site restaurant and is one block to the 2nd Street Light Rail Station. Garage parking and access to a 25,000 sq ft Fitness Center (which includes a pool) are both available for an additional monthly fee.